The Caribbean is home to some of the finest beaches in the world, as voted by Tripadvisor, the Caribbean Journal and our loyal travelers. Whether you can sail or not, there’s a dream Caribbean sailing vacation for you and we can help you make the most of the region, from the natural wonders of Belize to St. Vincent’ kitesurfing and the BVIs’ beach life. Sailing Belize starts with our base in the Placencia peninsula. With its 16 miles of dotted beaches, proximity to reefs, rainforests and great restaurants, such as Maya Beach Hotel Bistro, this beach area has managed to retain its old-world charm. Get in touch with nature by visiting the world’s first jaguar conservation reserve at Cockscomb Basin Wildlife Sanctuary or dive and snorkel the second largest barrier reef in the world. You may even get to see whale sharks! Find out more about Belize. Head to Pigeon Island and feel like you have it all to yourself. Stroll across uncrowded beaches, explore lower trails and ruins by foot, or hike to the top of Fort Rodney for spectacular views of the bay. Finish your day of exploring by relaxing on one of the soft strips of golden sand in the shadow of the Pitons. Rent umbrellas to shield yourself from the sun, or soak it all up in time for the striking sunset. Learn more about St. Lucia. Described by the Lonely Planet as “the finest in the Caribbean”, Flamenco Beach on the sparsely-populated island of Culebra is a refreshing escape from anonymous tourist attractions. 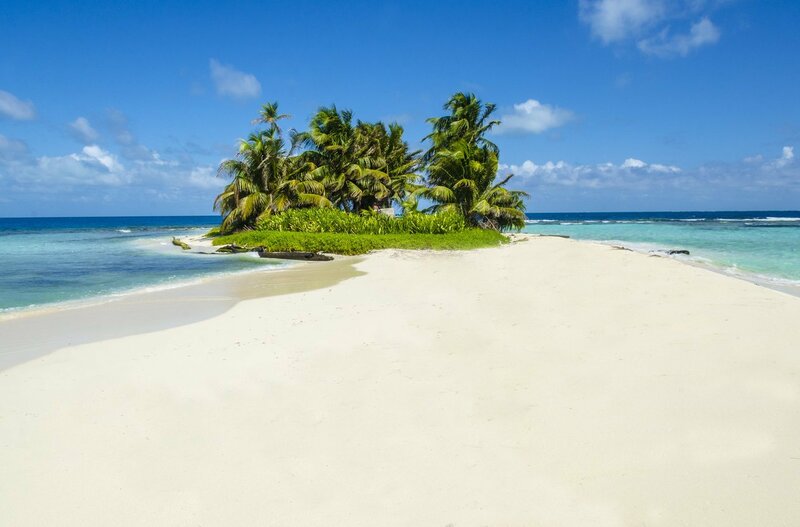 Imagine powdery soft sand backed by tree-covered hills and lapped by clean, turquoise water. Immerse yourself with nature in this special place, free of big hotels or resorts. This island feels untouched by the rest of the world. Explore more about Puerto Rico. Antigua is dotted with 365 stunning beaches and some, such as Pinching Bay beach, are undeveloped and only accessible by boat. The perfect opportunity for you to find a quiet spot in Antigua. Discover local history at Fort Barrington, a previous military defense post, which offers an educational complement to a soothing day of snorkeling and picnicking on the shore. Explore more beaches in Antigua to start planning your vacation. Visit Salt Whistle Bay, a half-moon beach that Conde Nast Traveler listed as a “top international beach”. The surrounding, cratered landscape has been shaped by the lively history of St. Vincent’s still-active volcano, La Soufrière. Yachts drop anchor in the bay and occasional day-trippers come ashore for a bit of lunch and sandcastle building. Try out kitesurfing or enjoy reading under a shady palm tree. Find out more about St. Vincent and the Grenadines. One of the BVI’s most popular beach attractions, The Baths, is known for its granite sky-high boulders, volcanic rock, colorful coves and delicious cuisine. Enjoy extraordinary swimming and snorkeling here, or conquer the trail through the ‘Caves’ to Devil’s Bay. This trek will give you a good introduction to the special BVIs. Learn more about the BVIs. Grand Case offers a lively atmosphere, an array of restaurants and beach bars and aquamarine waters. This beach area holds more than two dozen eateries on its mile-long main street, including the famous Bistrot Caraibes, known for its fresh seafood and French touch. The half-French, half-Dutch island uses its 120 different nationalities and 80-plus spoken languages to inspire vibrant local dishes. It’s a melting point of international cuisine, are your tastebuds hollering yet? Read a customer review of a sailing trip starting in St. Martin and find out more. Guadeloupe is an archipelago of over a dozen islands, offering visitors a wealth of possibilities, from an active volcano to deserted black-sand beaches. For a day jam-packed with activities, Plage Malendure beach fits every interest. This beach is home to the Parc del Memelles zoo, Le Tapeur zip line site and Le Saut Acomat waterfall. To enjoy the ultimate Caribbean island hopping experience, Guadeloupe has some of the best beaches in the Caribbean. Anchor at Anse Mitan beach and spend the day diving with dolphins beneath the glossy waves. Take a speed boat to an alcove to snorkel among local marine life, or even spot a west indian manatee if you’re lucky. Top off your day with a massage at one of the inexpensive waterfront hotels before returning to your floating hotel for a nightcap. Find out more about Martinique cabin charters. 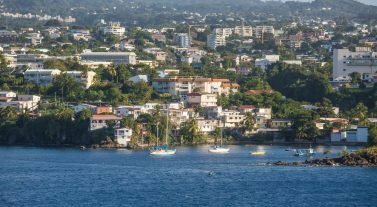 The largest beach in Grenada is known for its two miles of radiant sand and frothy waters, sought out for its almond and coconut trees, sea grapes, nearby spice market and chocolate factories. A treat for the senses, Plage de Grand Anse is Grenada’s main resort area, but somehow remains a charming and traditional atmosphere year-round. Start your morning off with a browse through the Grand Anse craft and spice market where you can take the local fragrance r home with you in spice sachets. Top off your day with a visit to the Grenada Chocolate Factory, an eco-friendly chocolate company that produces some of the best chocolate in the Caribbean. Skippered charters– Don’t have the sailing qualifications to reach your destination? Choose from our bareboat fleet and add a skipper if you can’t sail or simply want a more affordable and hassle-free vacation. By the cabin charters: You have a set itinerary, guaranteed departure, prepared, fixed menu, professional skipper and pre-booked double cabin with a private bathroom. You share your experience with other guests who have reserved the other cabins. Crewed charters: Feel spoiled with all-inclusive, luxury, five-star service. Everything is tailored to your needs and will stretch as far your budget will allow. Bareboat charters – The utmost in freedom and privacy, these yachts you sail yourself. While a bareboat charter certificate is not usually mandatory, we usually ask that you have sailing experience on a boat of similar size. To start planning your beach tour of the Caribbean’s best, please contact our team and they will help you find your dream destination and yacht. Email us at infona@dreamyachtcharter.com or give us a call at 855.650.8902.